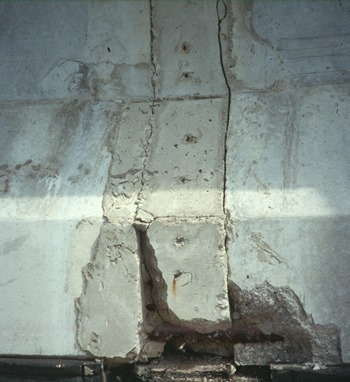 Different types of defects in concrete structures can be cracking, crazing, blistering, delamination, dusting, curling, efflorescence, scaling and spalling. These defects can be due to various reasons or causes. Structural deficiency resulting from errors in design, loading criteria, unexpected overloading, etc. Structural deficiency due to construction defects. Damage due to fire, floods, earthquakes, cyclones etc. Damage due to chemical attack. Damage due to marine environments. Damage due to abrasion of granular materials. Movement of concrete due to physical characteristics. In such case, the design is required to be reviewed in detail and remedial measures worked out by the design team. Once this is done the methods of carrying out the remedial measures will be similar to those arising out of other defects. Defects due to the quality of raw materials. Non adoption of designed concrete mix. Use of defective construction plant for producing, transporting, and placing the concrete. It is very necessary to choose the right type of cement for the concrete going into the structure under consideration. Ordinary Portland cement is the most common of all cements. Provided the quality of cement conforms to the relevant standard specifications, at the time of use, normally no problem is encountered in respect of ordinary Portland cement. Where the concrete is exposed to aggressive environment, it may be necessary to use special cements, such as, sulphate resisting Portland cement, blast furnace slag cement, low C3A cement. The quality of aggregates, particularly in respect of alkali-aggregate reaction, needs to be taken into account, fortunately cases of defects / failures attributed to alkali aggregate reaction in India are very rare. The use of water containing salt for making concrete can also contribute to deterioration of the concrete. The design of concrete mix can be satisfactorily carried out using a wide variety of aggregates. A reasonable continuity of grading of aggregates should be ensured. Excessive use of water in the concrete mix is the largest single source of weakness. The accuracy of weighing the various components is very much dependent on the quality of the weigh batching system, available. Spring loaded dials of the weigh batchers contribute toward$ excessive variability in the quality of weigh-batched concrete in India. Other contributory factors that add to bad workmanship include segregation, improper placement, inadequate or excessive vibration leakage of mortar through shuttering joints, inadequate concrete cover, in sufficient curing etc. 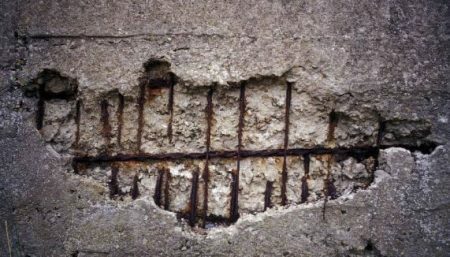 Proper detailing of reinforcement, including adequate cover is essential to ensure successful placement of concrete. Bad detailing results in congestion of reinforcement to such an extent that concrete just cannot be placed and compacted properly, even if the concrete is workable. Detailing of reinforcement should be based on a proper appreciation of how the concrete placement and compaction is going to be carried out. Poorly detailed drips and scuppers. Poor detailing of expansion joints. 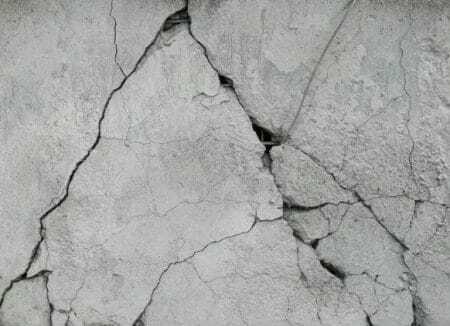 Cracks are formed in concrete due to many reasons but when these cracks are very deep, it is unsafe to use that concrete structure. Various reasons for cracking are improper mix design, insufficient curing, omission of expansion and contraction joints, use of high slump concrete mix, unsuitable sub-grade etc. To prevent cracking, use low water – cement ratio and maximize the coarse aggregate in concrete mix, admixtures containing calcium chloride must be avoided. Surface should be prevented against rapid evaporation of moisture content. Loads must be applied on the concrete surface only after gaining its maximum strength. 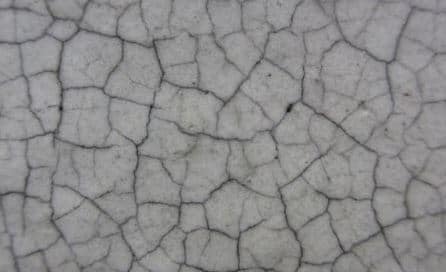 Crazing also called as pattern cracking or map cracking, is the formation of closely spaced shallow cracks in an uneven manner. Crazing occurs due to rapid hardening of top surface of concrete due to high temperatures or if the mix contains excess water content or due to insufficient curing. Pattern cracking can be avoided by proper curing, by dampening the sub-grade to resist absorption of water from concrete, by providing protection to the surface from rapid temperature changes. Blistering is the formation of hollow bumps of different sizes on concrete surface due to entrapped air under the finished concrete surface. It may cause due to excessive vibration of concrete mix or presence of excess entrapped air in mix or due to improper finishing. Excessive evaporation of water on the top surface of concrete will also cause blistering. It can be prevented by using good proportion of ingredients in concrete mix, by covering the top surface which reduces evaporation and using appropriate techniques for placing and finishing. Delamination is also similar to blistering. In this case also, top surface of concrete gets separated from underlying concrete. Hardening of top layer of concrete before the hardening of underlying concrete will lead to delamination. It is because the water and air bleeding from underlying concrete are struck between these two surfaces, hence space will be formed. Like blistering, delamination can also be prevented by using proper finishing techniques. It is better to start the finishing after bleeding process has run its course. Dusting, also called as chalking is the formation of fine and loose powdered concrete on the hardened concrete by disintegration. 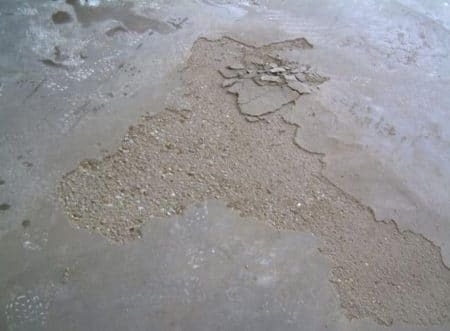 This happens due to the presence of excess amount of water in concrete. 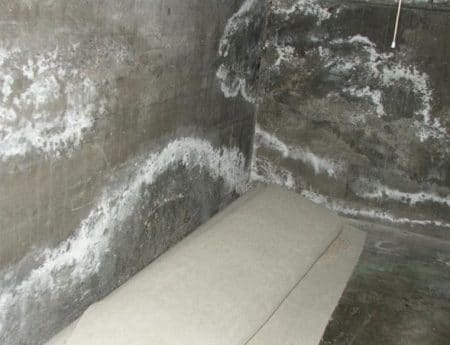 It causes bleeding of water from concrete, with this fine particles like cement or sand will rise to the top and consequent wear causes dust at the top surface. 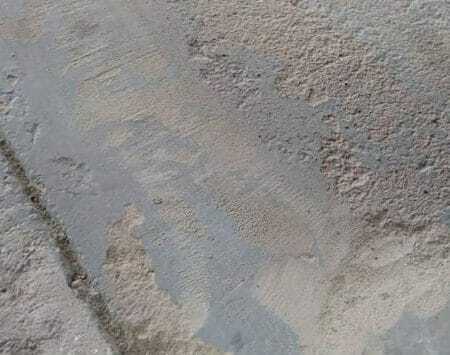 To avoid dusting, use low slump concrete mix to obtain hard concrete surface with good wear resistance. Use water reducing admixtures to obtain adequate slump. 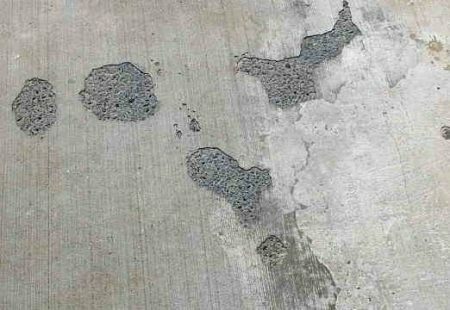 It is also recommended to use better finishing techniques and finishing should be started after removing the bleed water from concrete surface. When a concrete slab is distorted into curved shape by upward or downward movement of edges or corners, it is called curling. It occurs mainly due to the differences in moisture content or temperature between slab surface (top) and slab base (bottom). 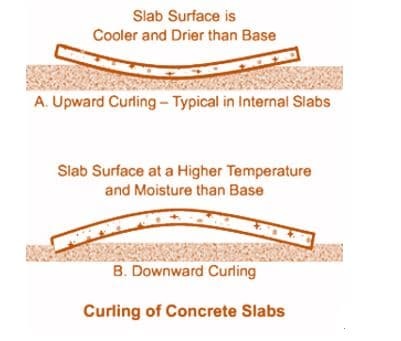 Curling of concrete slab may be upward curling or downward curling. When the top surface is dried and cooled before bottom surface, it begins to shrink and upward curling takes place. When bottom surface is dried and cooled due to high temperature and high moisture content, it will shrink before top surface and downward curling occurs. To prevent curling, use low shrink concrete mix, provide control joints, provide heavy reinforcement at edges or provide edges with great thickness. 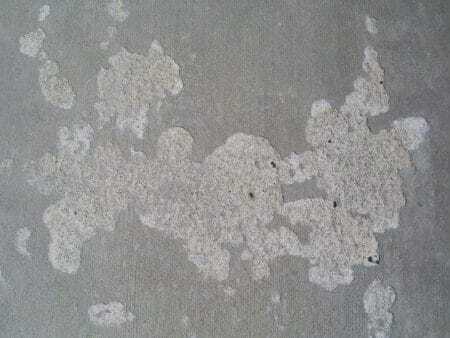 Efflorescence is the formation of deposits of salts on the concrete surface. Formed salts generally white in color. It is due to the presence of soluble salts in the water which is used in making concrete mix. When concrete is hardening, these soluble salts gets lifted to the top surface by hydro static pressure and after complete drying salt deposits are formed on the surface. It can be prevented by using clean and pure water for mixing, using chemically ineffective aggregates etc. And make sure that cement should not contain alkalis more than 1% of its weight. Scaling and spalling, in both the cases concrete surface gets deteriorated and flaking of concrete occurs. The main cause for this type of cases is penetration of water through concrete surface. This makes steel gets corroded and spalling or scaling may occurs. Some other causes are use of non-air entrained concrete mix, inadequate curing and use of lo strength concrete etc. This type of defects can be prevented by, using well designed concrete mixes, by adding air entrainment admixtures, proper finishing and curing, providing good slope to drain water coming on to the surface etc.